Please find attached the notice for the next EMHS meeting. Please find attached the EMHS March newsletter. Join us on a walk around the Fitzroy Gardens as our leader, Rosie Smith, tells us some of the many stories that make up the history of the Gardens. Dr. Ross McMullin is an historian and biographer whose major interests are Australian history, politics and sport. An exhibiton of paintings by Joyce Meier will be held at the Bridget McDonnell Gallery, 130 Faraday Street, Carlton, from 9 to 30 November. All shortlisted and winning entries from the biennial amateur photography competition, Snapped: Melbourne in a moment, are now on display upstairs at East Melbourne Library. Drop in and be inspired by the work of our talented entrants. In 1914 the world will begin centenary commemorations of the First World War. Along with many of their fellow Australians people from East Melbourne flocked to enlist. Many were heroes. Many lost their lives or suffered horrific physical or mental injuries. Many at home worked, endured and suffered consequences. In response to telephone calls and emails to the MCG executive office there has been a higher level of consciousness of the issues and some immediate actions to protect some areas. We are hoping for continuing improvements, especially as the footy season gets under way. Is Yarra Park being managed appropriately in accordance with its registration on the Victorian Heritage Register? The southern corner of Yarra Park is taking a particular beating from car parking this summer. Our new photo record tells the story. If you have a strong interest in military history you may be interested in joining Military History and Heritage Victoria which currently has two vacancies on its executive committee. MHHV provides a forum for people and groups who are passionate about military history and heritage in Victoria. It promotes research, preservation, education, and commemoration of Australian and Victorian military history and heritage. Amongst others, MHHV is supported by the City of Melbourne, the RSL and the Shrine of Remembrance. More information can be obtained fron the MHHV web site. If you are interested in joining MHHV or serving on its committee please use the contact form on their site. EMHS members are invited to contribute their thoughts on the Society's involvement in planning and heritage issues. Follow this link to join the forum. Pandora's Box is to acquire some new contents. And it relates to you! The East Melbourne Historical Society has agreed to a request from the State Library of Victoria for our website to be periodically archived on PANDORA, the web archive of the National Library of Australia. This will improve the accessibility of our website and ensure its continuing availability for future generations - even after your current committee has joined Pandora in Never Never Land. The tree versus the bull barThe EMHS referred its photographic essay on the devastation of Yarra Park to the Premier of Victoria. Similar letters were also sent to the Lord Mayor and the local State Member of Parliament, Bronwyn Pike. The Premier's office, unlike the local member, at least gave us the courtesy of a reply. Unfortunately the Premier passed the buck to the Minister for Sustainability and Environment who in turn passed it to one of his divisional heads. By this time the buck, which was already on very thin ice, sank without a trace. The reply we received was a triumph of obfuscation and spurious argument. "Widening roads to solve traffic congestion is like loosening your belt to cure obesity,"says Walter Kulash, a traffic engineer from Orlando, Florida - something to keep in mind when contemplating the planned roadworks on Hoddle Street. Yarra Park at its Lowest Point? Yarra Park 2 August 2010The East Melbourne Historical Society has published a gallery of photographs recording the current condition of Yarra Park, perhaps at its worst in living memory. As many residents of East Melbourne have noticed, car parking in Yarra Park throughout this wet football season has been severely damaging to the Park. As an estimate, 70% of the Park's surface is now down to bare dirt or mud. Scores of trees are damaged, dead or vanished. Trucks and cars are driving over the roots of trees and parking hard up against them. Even the historic Aboriginal trees have only thin, narrow fringes of grass around them. The gallery tells the story quite unambiguously. 2010 City of Melbourne Growth FrameworkOur President Jill Fenwick reports on recent correspondence and discussions with the State Government and with the City of Melbourne concerning Yarra Park and developments in the sporting precincts and along the railway lines. The news is not good. (Was there ever a "Good News Week"?) The council denies responsibilty for Yarra Park and the State Government acts as though it is being managed despite the depressing evidence to the contrary. The sporting precinct has become a breeding ground for white elephants. The new City of Melbourne Municipal Strategic Statement is a multiple pregnancy - species unknown. Has anyone noticed? Yarra Park has gone the way of James James Morrison's Mother. She has disappeared! One wonders, was it despite or because of repeated warnings from the National Trust (commonly known as Jim) about green wedgies at the end of Town? In any case, Yarra Park donned her golden gown this autumn - and promptly disappeared from the City of Melbourne's records. Greg de Moore was to speak to us on 16 June 2010 about Tom Wills, the co-founder of Australian Rules Football. Unfortunately Greg has had to reschedule. However, John Briggs, a heritage architect, known to many in East Melbourne, has agreed to speak to us on 16 June about heritage conservation, a subject dear to all of us. Please bring your friends but do call Deirdre first! Missed the quiz? Don't worry, John Clarke provides the answers. Punt Road. The other photo shows the Franz Joseph Glacier, where some actual movement has been detected by scientists over the past 600 years. Yarra Park 1864In culmination of a long campaign by the East Melbourne Group, the Heritage Council of Victoria has added Yarra Park to the Heritage Register. This means that any major developments will require a permit from Heritage Victoria. Rupert Murdoch's "Melbourne Leader" reacted in form. "Heritage listing puts MCG car park under threat," its headline said. It continued, "The future of game-day carparking at the MCG is under a cloud after Yarra Park was added to the state’s heritage register. East Melbourne residents were last week celebrating after a hard-fought campaign to have the park added to the register." See the full decision of the Heritage Council and the Leader article in our catalogue item, Yarra Park Heritage Listing 2010. Project team members: - Jill Fenwick, Nik Iljin, Wendy BabiolakisThe East Melbourne Historical Society has received a grant of $2,290 from Museums Australia (Victoria) to digitise its collection. Digitising involves creating high quality electronic images of items in the collection and loading them onto the web site. The collection may then be searched or browsed via an on-line catalogue and digitised items can be viewed in detail. The grant provides funds to buy imaging equipment, software and services to begin the process. Thumb print of missing planA significant hole has been plugged in our set of MMBW plans for East Melbourne. 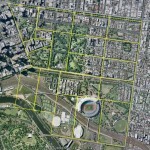 The missing plan covers the area bounded by Grey, Hoddle, Hotham and Powlett Streets. It was drawn in 1899 but had managed to escape digitisation until clever detective work by the State Library Maps Collection uncovered its whereabouts and took it into custody. Its particulars have now been digitised by the Imaging department and it is available in our Gallery where you are free to pan and zoom at your pleasure. As you will see, even after such a long period at large the item is in quite remarkable condition although admittedly a little ragged around the edges. The East Melbourne Historical Society catalogue is now on the web site. Just click on the Catalogue menu item at the top right or follow this link: http://emhs.org.au/catalogue. You can browse the catalogue, search for any terms or look for specific topics, building names or addresses. If you would like access to any items please don't hesitate to Contact us. Our website is undergoing a major upgrade. During the next few days a number of changes will be made which will improve the appearance of the site, accessibility of information, functionality, speed and security. Please accept our apologies for any inconvenience during this process. If you experience any particular problems please contact us or leave a comment below. Index to MMBW plansWith the permission of the State Library of Victoria, the East Melbourne Historical Society has published a (nearly) full set of MMBW plans drawn between 1895 and 1900 covering East Melbourne. The easiest way to access the plans is from the Index to MMBW plans. The plans are highly detailed showing house outlines, out-houses, facilities, pipes, drains, ground surface types and many other details applying at the time. As a historical record of East Melbourne they are extremely informative and quite unique.